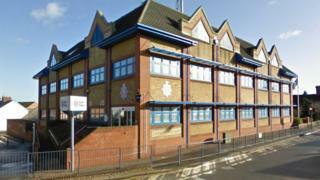 Three Kent Police officers are to be interviewed following a man's death in custody, the police watchdog has said. Carl Maynard, 29, died at Tonbridge police station on 13 October. He had been arrested in Maidstone over a domestic incident alleged to have happened on 1 October. He received medical help but later died. Kent Police said it was assisting the Independent Police Complaints Commission (IPCC) investigation. The IPCC said it had asked Kent Police to update its procedure where an officer knows or suspects a person urgently needs medical attention. It said the three officers had been informed their actions and subsequent care given to Mr Maynard may have constituted gross misconduct. IPCC operations manager Catherine Hall said: "The serving of the notices on the three officers represents a new stage in our investigation but I would like to emphasise it does not indicate guilt on any person's part." She said post-mortem tests had proved inconclusive and further tests would be carried out. A statement issued by Kent Police said: "The force has been notified by the IPCC that three officers will be interviewed about the events leading up to Mr Maynard's death but it would not be appropriate to comment further until the investigation has concluded. "Kent Police has already accepted one recommendation made by the IPCC in relation to the incident, and has taken steps to ensure the suggested action is carried out."